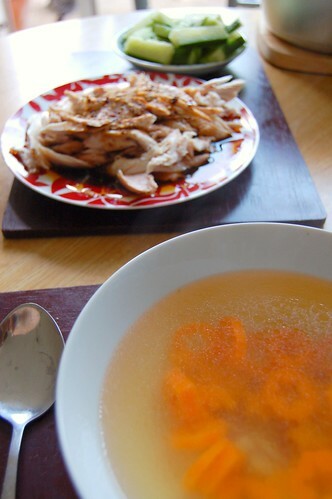 So, here we are on our first round of leftovers with the chicken from Jamie’s Feel Good Chicken Broth. I don’t have very much in the house, so dispensing of the rest of the chook is going to be a real challenge. Luckily, I have the very handy and excellent Sichuan Cookery by Fuchsia Dunlop, which has about four or five easy and tasty recipes for cooked chicken at the front. 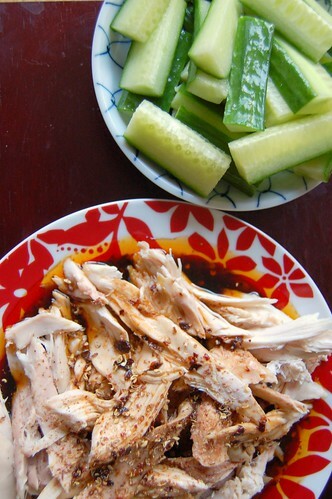 Today I made hot and numbing chicken (not to be confused with numbing and hot chicken, which mixes spicy chilli oil and toasted, ground sichuan pepper together with soy sauce and sugar to create a really delicious cold dish. You’re supposed to serve this with spring onions, but sadly I don’t have any in the house, so we made do with half a cucumber. Pretty nice! I’m growing to really appreciate cucumbers as an accompaniment to hot Chinese dishes, as the slippery, refreshing crunch is a great counterpoint to the spicy, salty tastes from Sichuan cookery. I served the salad with hot plain rice and the last of the chicken broth. I thought this would make a cleansing balance for the spiciness of the chicken salad, but sadly, I was wrong. The broth was totally overwhelmed by the chilli and ended up tasting of nothing. Shame. But hey, it all looked pretty on the table, and that’s all that matters… Right? In other news, I need new placemats. Look at them. Shabby.